I’m going to start this review by making a few clarifications. First, I’m reviewing it largely in the context of Star Citizen, though I will also talk about how it performs in other games, as well as in VR. Second, the stick itself was provided to me by Saitek to review. Third, I am a terrible, terrible pilot. 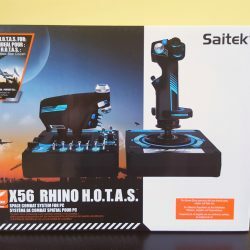 The Saitek X56 Rhino is the most recent HOTAS offering from Saitek, one of the larger Joystick manufacturers around. A larger controller setup, the Rhino retails for around 330$ Canadian. It has switches, toggles, buttons, triggers, LED lights, the works. The fate of Saitek is currently up in the air though. Formerly a subsidiary of MadCatz, Saitek were recently bought out by Logitech. 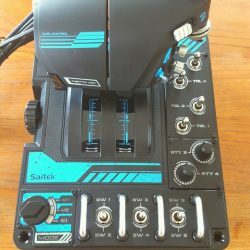 The Rhino was designed and manufactured while Saitek were still with MadCatz. 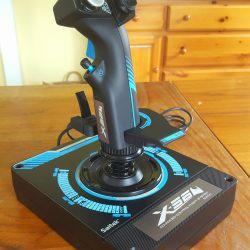 This review was performed before Logitech bought Saitek, and the joystick was provided for review by Saitek. Let’s start with how the Rhino feels. The stick portion feels solid enough, and while constructed of plastic, it feels sturdy, it doesn’t have much give, and even during my most frantic, flailing attempts at flight, it stays upright. The stick is large as well; even with a riser on the wrist-rest, my hand didn’t rest on it. Not that its size is too much of an issue; all the triggers, buttons, and hats are easily reachable. Unfortunately, one of the triggers on the stick, the pinky trigger, feels… weak. And it is weak, as I’ll detail later in this piece. It just doesn’t feel right. On the other hand, the Rhino’s throttle feels even better than the stick. It feels somehow more solid, while still sporting the same plastic construction. It feels weighty in a way, and all the switches, hats, and toggles on the throttle just feel… right. The only issue with the throttle is a very minor one; the throttle is a ‘split’ throttle, and when it’s in its split configuration, the two halves rub against each other slightly. It’s so minor a complaint I’m almost hesitant to mention it, but it does appear to be a strange, and intentional, design decision. I just don’t get it. Inputs on a joystick are important, we all know this. Your hands are more or less glued to the controller, and having to move to press shortcuts on a keyboard is pretty much out of the question, so a lot of inputs on the HOTAS itself are pretty key. Thankfully, the Rhino has plenty of switches, toggles, triggers, hats, and buttons. Seriously, they’re everywhere. The throttle itself is the best example of this, with two hats, two swivelly things, an analog thumbstick, 7 switches, two dials, and more. It’s got a lot. Seriously. And most of those switches are pretty easily reachable. Remembering what you’ve bound each one to is a different matter, but that’s more an issue with me being a horrible pilot; nothing the stick can do to remedy that, sadly. Needless to say, I’m a huge fan of the throttle. The joystick on the other hand, has the aforementioned flimsy pinky trigger as its main standout problem, and then it has three hats at the top of the stick that just… they don’t feel right, personally. Neither does the thumbstick. I feel like in including so many hats, the joystick misses out on things like triggers, or a missile toggle, that I feel would feel better. Sure, the hats provide a lot of customization options, but I don’t feel like the stick needs three at the top. One hat, and some other buttons, would likely serve better. That said, aside from the pinky trigger, all the hats, triggers, and buttons on both the stick and the throttle feel good. I don’t like the thumbsticks yet, but I might get more used to them with time. All in all, the stick does fairly well, input-wise. First off, what is the plural of axis? Weird word. Aside from that, not really much to say on the axis question. The Rhino is standard. The throttle provides forward and back (or just forward, if you’re simple like me), pitch, yaw, and roll. Anything else you’d have to bind to hats, thumbsticks, or dials. No fancy six degrees of flight here. Axes: 5/10? 7/10? How do you rate ‘standard’? Profile software is an important part of any advanced joystick solution. Unfortunately, I have almost no experience using profile software, and I sometimes get confused when using internet browsers, much less complicated HOTAS configuration programs. That said, the software appears to be very detailed, with both basic options for plebs like me (I’ll pick a standard acceleration curve, thank you), and with more advanced options for people who can actually fly. Confusing, but clearly pretty powerful. So, lets talk about how the Rhino performs in actual games. Here it gets a bit more difficult to figure out what to talk about. Things are less concrete, and even more of a personal opinion. Still. The ‘regular game’ (read – not space game) that I played most often was War Thunder, because I like the game, I put a lot of time into it with keyboard and mouse, and it has a fairly detailed ‘realistic’ setting. In War Thunder, atmospheric flight seemed to work really well, and the joystick didn’t reduce my skill too much. It was definitely more difficult to fly and be accurate with, but flying just felt better. I did have some issues with keybindings; anytime I used the pinky trigger the game would open the ‘pause’ menu, and I still have no idea why that was happening, but overall the stick just… worked like you’d expect a stick to, really. In VR, I tried out two games, War Thunder and Elite: Dangerous. Both games, in VR, looked amazing, and flying with a throttle and stick while looking around just felt… it felt amazing. Dizzying, exciting, thrilling, and really just a whole lot of fun. But that’s down to VR, and to the games. The Rhino felt good in VR, its sturdiness lending a bit of credence to the VR illusion, but it was also plain hard to work. Lets just say I ended up suiciding more times than I would normally prefer to. Now, this isn’t necessarily a problem with the Rhino exclusively. Any current HOTAS will have the problem. But it’s a space that joysticks could use a lot of improvement. VR is great for flying games. Where VR suffers in FPS games, due to inducing dizziness when moving. In driving and flying games, you’re stuck in your seat, and can fully enjoy some truly jawdropping visuals. I will want to play any and all flying games in VR from now on. And honestly, I’ll want to play them with a HOTAS. The extra immersion added is perfect for VR, since that’s what it’s all about. For serious VR implementation, though, next generation HOTAS’ might need to start considering ‘trackers’, so with a system like the Vive, a vague, shadowy overlay of the HOTAS could be displayed to you. So that you can move your hands from the joysticks and still have awareness of where they are. It’s a complicated suggestion, and might not make sense if you’ve never played a game in VR, but… if Star Citizen ever becomes a VR game, this is something that joysticks will need. Again, the Rhino feels pretty solid in Star Citizen. 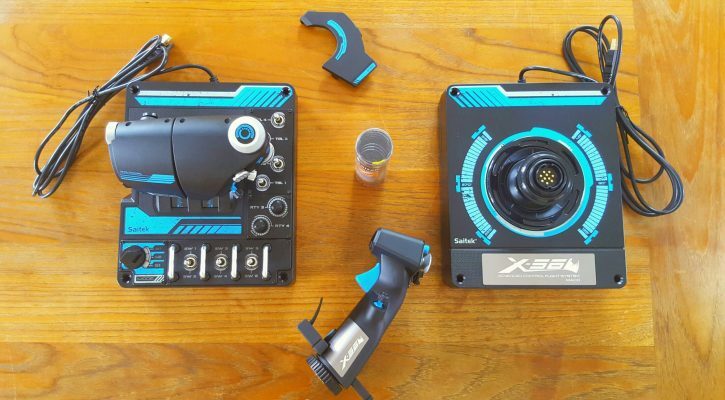 While the thumbsticks on the throttle and stick don’t control gimbals too well, they’re better than nothing. In Star Citizen, the stick really suffers from the same drawbacks it did in other games. The stick itself has too many hats, making it impossible to bind all weapon groups and missiles to buttons. 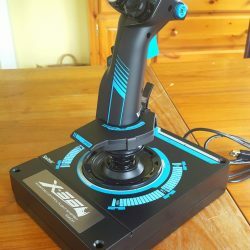 Overall the stick performs well for Star Citizen, but as the probable predecessor to the Star Citizen HOTAS, there’s a lot about its design that should probably be improved. Here’s where we get to the fun part. 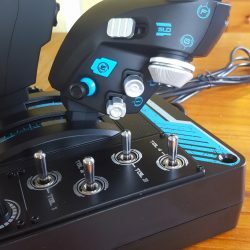 A while ago, when the Star Citizen HOTAS was first announced, I wrote an article theorizing that Saitek’s QA might have improved, based on recent improvements by Madcatz, and based on the knowledge that Star Citizen would probably be a huge market. The first stick broke within the first two days. The pinky trigger, the one I’ve said a few times before is very wonky, simply stopped working. That pinky trigger, to me, is the worst feeling and most worrisome part of the whole stick. I don’t know why it’s there, and I don’t really think it should be. On the other hand, aside from that pinky trigger, the joystick, while plastic, feels solid, and the throttle honestly feels amazing. Recently, Logitech acquired Saitek from MadCatz. Now, Logitech hasn’t made joysticks in a while, not since they tried to create a force-feedback joystick that failed miserably, but before that ill-fated attempt, Logitech’s sticks were a standard for superior quality. That’s all to say that, with some luck, Logitech’s QA process (fun fact; my most recent mouse, a Logitech G700, has lasted me longer than any other mouse I’ve ever owned. I normally go through two a year. It’s a problem) will bleed over to Saitek’s, improving the quality of their sticks. 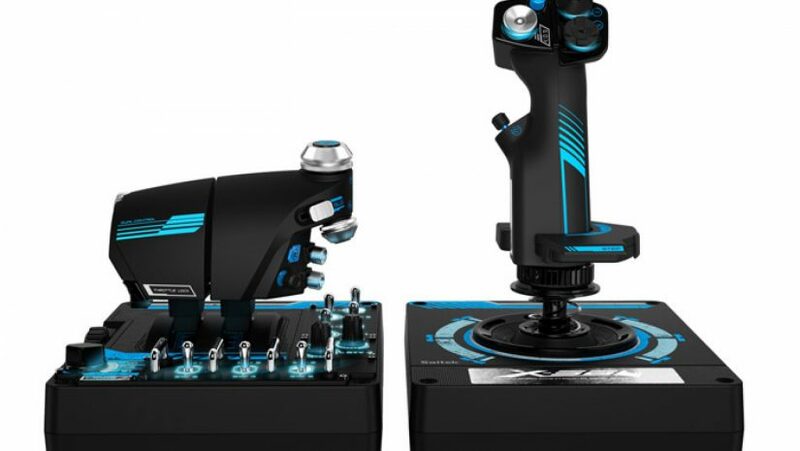 Unfortunately, with Logitech’s acquisition of Saitek, it’s unclear who will be making the Star Citizen HOTAS. We don’t know if the contract for it was with Saitek or with Madcatz, or even if the contract will carry over. It all means that, overall, the Rhino is an okay stick. Its QA is worrisome, and some of its design decisions don’t make too much sense, and don’t bode too well for the Star Citizen HOTAS, but the recent acquisition of Saitek by Logitech throws a shadow of doubt on, well, everything. Now, I haven’t tried other high-end sticks yet. The Thrustmaster Warthog is supposed to be the pinnacle of HOTAS excellence, but it’s also a fair bit more expensive. If you’re looking for an all-around decent HOTAS, and can come to terms with possibly having to RMA it a few times, then the Rhino will serve you well.